Everyone needs a pair of small diaphragm condensers. Sterling audio have released an affordable matched pair that won’t flatten your wallet. Both mics comes with a carrying case, complete with shockmounts and windscreens. 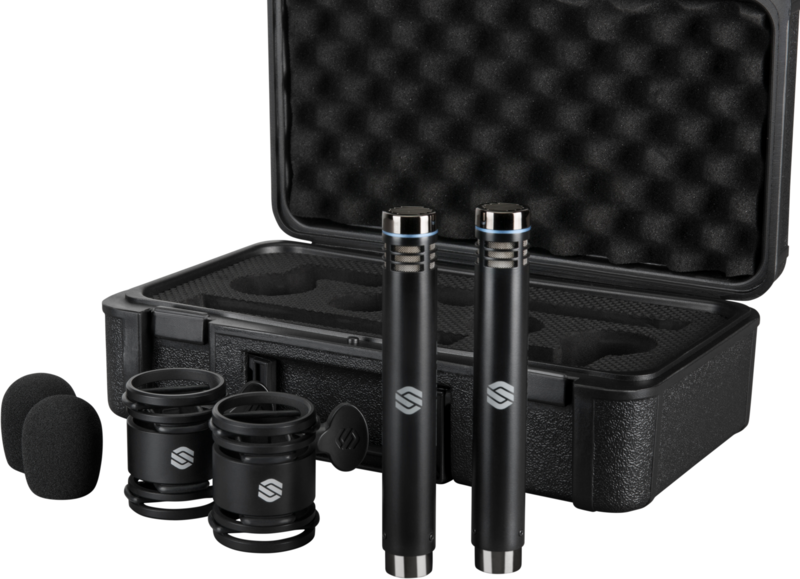 Sterling Audio, makers of high-quality studio recording equipment, announces the SL230MP medium-diaphragm condenser microphones. Offered as a matched pair, the SL230MP mics are an excellent choice for capturing ultra-realistic stereo recordings of acoustic guitar, piano, percussion, choirs, string sections, entire bands or orchestras, and more. As expected from Sterling, the sound and build quality is comparable to that of microphones many times more expensive. Each SL230 mic employs a real gold-sputtered condenser capsule with a six-micron membrane, allowing for very high sensitivity to even the subtlest dynamic nuances in the source material. The mics’ cardioid pickup pattern provides excellent rejection of off-axis sounds, and a Class-A FET (field effect transistor) circuit design fosters smooth, wide frequency response and clean, consistent performance. As with most condenser mics, Sterling Audio SL230s operate on standard 48 volt phantom power. A switchable highpass filter at 75 Hz rolls off rumble and subsonic vibrations. Thanks to a selectable -15 dB pad, the SL230 can be used in in high-volume applications where many condenser microphones fear to tread. With the pad engaged, the SL230 handles sound pressure levels up to 150 dB, making the pair a good option for applications such as drum overheads in a live setting. Sterling Audio takes the utmost care in the matching process, ensuring that the two mics exhibit frequency response and output characteristics within a single dB of one another for consistent level matching in stereo applications. The two SL230s come with a rugged, padded protective case, two SM9 shock mounts, and two windscreens. The Sterling Audio SL230MP cardioid condenser microphone pair is available March 1, 2019, at Guitar Center retail stores and online at Musician’s Friend (musiciansfriend.com) for just $149.99. To find out more about the full line of Sterling Audio mics, monitor speakers, headphone amps, and recording accessories, visit https://sterlingaudio.net.